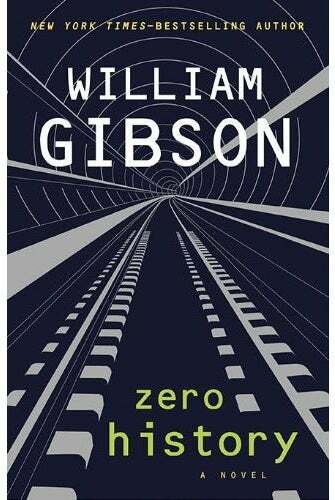 A dark caper whose players stretch from paramilitary contractors in the U.S. to secret label fashion designers who fetishize "slubby" jeans, Zero History is William Gibson's hommage to the fashion industry. Especially its dangerous, geeky, corporate-espionage underpinnings. The third book in Gibson's Bigend Trilogy, which includes Pattern Recognition and Spook Country, Zero History brings back the rich trickster-producer Hubertus Bigend, whose Blue Ant advertising agency serves as a portal between the creative underground and commercial selloutery. Bigend is a master at spotting emerging underground trends and hidden talents that are about to explode. The problem is that he usually wants to take brilliant if obscure works of art and turn them into car commercials or guerrilla marketing strategies. Of course Bigend's culture machine is only a problem from the point of view of Zero History's protagonist Hollis, a once-famous indie rocker whose post-1990s career has been spotty at best. Having lost all her money in the recession, Hollis is just desperate enough to answer a call from Bigend, who wants her to track down the mysterious creator of a "secret brand" of denim clothing called Gabriel Hounds. Though her previous work with Bigend (in Spook Country) left a bad taste in Hollis' mouth, she's also gotten a new career out of it - her research for him resulted in a book of art criticism that's helped reboot her career. As Hollis begins her reluctant search for the Gabriel Hounds designer, whose thick, indigo-scented creations are rendered in luscious detail, we discover that Bigend has another sleuth on the job too. As a kind of lark, Bigend has employed a drug-addicted Russian translator named Milgrim (the abused government informant from Spook Country). He's sent Milgrim to an experimental drug rehab center where researchers combine psychotherapy with blood transfusions and unmarked white pills. Like one of Bigend's art projects, Milgrim emerges from his cocoon of obscurity with "zero history" - a blank past - and begins to grow a talent for observation and design aesthetics. Which comes in handy when Bigend has Milgrim going to secret meetings with underground jeans dealers and military fashion spies. That's right - military fashion spies. Only Gibson could tell a story that plausibly takes place in the liminal space where the frayed edge of the paramilitary marketplace touches the hem of the fashion industry. Bigend has gotten interested in the idea of capturing military uniform design contracts, partly because uniforms are so influential in the fashion industry. In typical Bigend fashion, he's decided to turn fashion logic on its head and get high-end designers (like the Gabriel Hounds creator) to make military uniforms for the US government. As the fashion industry goes belly up, and military contracts dry out, he speculates that the one place a design-minded magnate with no scruples can make money is in combat uniform design. One of the many joys of reading Gibson, especially in the Bigend series, is following his characters through improbably overlapping subcultures - Hollis and Milgrim wander from a French retro fashion fair into a potentially deadly encounter with paramilitary types who aren't afraid to resort to kidnapping and murder to win a government clothing design contract. Gibson loves to immerse his readers the details and specialized language of everything from fashion and high-end promotional stunts, to armored cars and UAVs. And always, Gibson introduces us to everyday technologies as if they came from the future or an alternate world. Milgrim learns about Twitter, but only as a system for covertly communicating with a justice department agent. Surveillance drones are silvery balloons controlled via a game-like iPhone app. It's not long before you realize that Zero History is about the way military culture has permeated every aspect of our lives, from art to fashion and advertising. The question is who can dominate in this military-fashion PR complex: Will it be the ex-military types vying with Bigend for government contracts, or will it be the ex-entertainment industry types who market their slubby jeans with the cunning of covert operatives? If you read Zero History as a caper, the whole book careens towards a crazy, mesmerizing final confrontation between the forces of fashion and the might of the paramilitary, orchestrated by a handful of people who specialize in what can only be called urban guerrilla performance art. But if you read it as a mystery, the novel yields another meaning, about the dashed hopes of indie artists of the 1990s who hoped to free themselves from commercialism and create truly "alternative" work. Hollis is one such indie artist, as are her former bandmates, both of whom have lucrative careers in the culture industry. The closer Hollis gets to discovering the identity of the Gabriel Hounds designer - an artist deliberately outside the fashion marketing machine - the more we learn about what selling out has meant for her and her cohort. Solving the mystery, erasing the "zero" in the Gabriel Hounds' history, won't leave you with a pat answer to the sellout question. Instead it will remind you that anything can be art, from jeans to advertisements. And there is really no such thing as not selling out. Either you control the means of marketing, or you don't. But there is no escape from the market, no escape from commodification. The book hits bookstores today! Pick up a copy at your local favorite bookstore, or buy one here.